That's a record I've been wanting to listen to for a while now. It was actually issued almost 1 year ago, and for some reason I just got a hold of the 2LP version a few days ago. That's a tremendous 180g-couple of vinyls packed in a beautiful silver gatefold. The reason I've been attracted to that record is quite simple: Avatarium is Leif Edling's new band. You know, the guy from Candlemass. So basically, if you like doom (and I like my Doom), you usually follow whatever this guy is up to. Besides that cult band he founded, he's also involved in Krux, another awesome doom band with Mats Leven on vocals. We all know that every record Leif Edling's been involved with usually deals with Doom Metal. And considering that Krux's latest album (III-He Who Lives Amongst The Stars) is pretty close to the latest Candlemass records, the obvious question is: what's the point in having another Leif Edling Doom band? Well, a quick look at the line-up should give you a hint: vocals on Avatarium are performed by Jennie-Ann Smith. This new talent (never heard of her before) is definitely a great surprise. Her vocals perfectly fit the typical heavy riffs, and she adds a very nice ethereal feeling to the music. I just love the way she sings; her voice is powerful, clear and pure, but she never "pushes" it too much. There's nothing too bombastic here, only perfectly balanced and in-tune vocals. But there is more to Avatarium than those unusual vocals. In fact, Leif Edling has managed to write some pretty great "pop-doom" tunes. The kind of songs you've never heard before, with some awesome melodies. My personal favorites are title track "Avatarium" and "Birds Of Prey" (amazing keyboards on this one). The closing power-ballad "Lady In The Lamp" is also fantastic, as a last reminder of Leif's incredible talent for songwriting. The best illustration however of that pop color to the record is "Boneflower". this song will instantly convince you that the record is worth the investment. 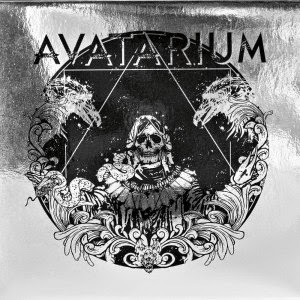 To make a long story short, Avatarium is obviously another great doom band formed by Leif Edling. And it is very interesting to see how the guy manages to explore slightly different shades of that very specific style with each new band he forms. Candlemass is probably the most "classic" one of them, Krux has this more extreme and psychedelic approach and Avatarium has a unique almost "pop" feeling. Leif Edling remains unchallenged as THE master of Doom with yet another fantastic record released, driven by a very clear vision of what his music should sound like. Folks, the man definitely knows what he's doing; next time he releases a record, just go grab it.